Do it yourself: Flower Arrangements, Bridal Bouquets, Boutonnières and more for your wedding. A daughter’s wedding is a memorable time for a father. You can often find it very difficult to give your speech without becoming overly emotional. Taking time to think about what you want to say can help you make sure you convey your heartfelt feelings and maintain your composure. Try to reflect back on stories about your daughter that you’d like to tell others. Choose things from the past that represent what she’s all about. Stories about how she dealt with her pets or siblings can offer insight into her true nature. You can relate how you felt on the day she was born, and throughout the milestones of raising her. Recall special times the two of you spent together. You can talk about incidents that helped her develop into the person she is today. It’s good to invoke humor into your story telling, but remember to include your feelings as well. It’s okay to let everyone know how much you love her. You can talk about what it’s like to see her grown and starting a new life. Explain to her how it might be hard for you to let someone else take over your duties of caring for her well-being. This is where you can also talk about your new son-in-law. You might have some amusing stories about when your daughter first started dating him, or when she first introduced him to the family. You might want to jokingly speak of any misgivings you might have had and how that changed as you got to know him better. Be sure to let her (and him) know that you think she’s made a good choice for a partner. If you feel it’s appropriate, you can offer the new couple advice on what lies ahead. Of course, you only want to talk about all the positives of marriage. It’s perfectly okay to point out that life will not be all champagne and roses, but you can use the opportunity to give them tips on how to weather the good and the bad times together. Maybe you can sight your own marriage as proof of what it takes to make a good marriage that lasts. In your conclusion, you’ll want to give them your blessing by wishing them a happy future together. Let them know you love them and will be there for them as they start their new life together. 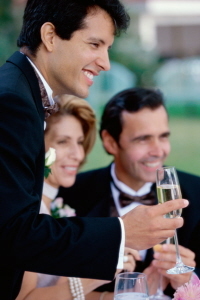 Offer a toast to their happiness. Category DIY Speeches | Tag father of the bride speech | Bookmark the permalink.